Yesterday's release of the annual Social Security Trustees' Report caused a flurry of media coverage and commentary, including Dean Baker's observation that this year's report predicts much higher future wage growth than prior reports. In fact, the new report forecasts that annual wages will be 47.8% higher in 2040 than in 2010 (adjusted for inflation). In the month leading up to the report's release there's been, as CNN describes it, a "red-hot debate over raising the retirement age" for Social Security. CEPR is helping inform the debate by busting certain myths. 1) MYTH: Since most of us sit in front of computers all day, we can work longer. FACT: Close to half of older workers have jobs that are physically demanding or have difficult physical working conditions. Hard Work? 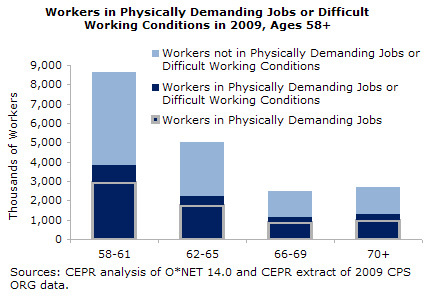 finds that over 8.5 million workers (45%) over the age of 58 have such difficult jobs. Over 3/4 of older workers without high school diplomas have difficult jobs, and over 1/2 of older Latino workers and older workers in the lowest wage quintile have physically demanding jobs. 2) MYTH: Since life expectancies are longer, we should raise the retirement age. FACT: This often-repeated mantra refers to average life expectancies, which rose sharply during the 20th century due to increased childhood survival rates. Social Security and the Age of Retirement explains that once they make it to age 65, workers born in 1999 have less than 5 years more life expectancy than those born a century earlier. And those born in 1999 can expect to work 6 years longer than those born in 1899. 3) MYTH: Raising the retirement age is an alternative to cutting benefits. FACT: Raising the retirement age is a benefit cut, since workers would have to pay more in to get the same level of benefits. The Impact of Social Security Cuts on Retiree Income points out that raising the normal retirement age would hit both lower-income and younger workers harder -- for example, raising it to age 70 would mean a 10% reduction in benefits for workers aged 40-44 in 2007. 4) MYTH: Raising the retirement age would go a long way towards eliminating budget deficits. FACT: The amount of savings from raising the retirement age is dwarfed by other policy ideas, such as increasing the income cap for Social Security taxes or a financial speculation tax. See for yourself: the CEPR Deficit Calculator lets you pick various items and shows their effect on the national debt in 2020.